Our regional weaving convention is around the corner, and one of the display areas is about hand made bags, contributed by various guild members. 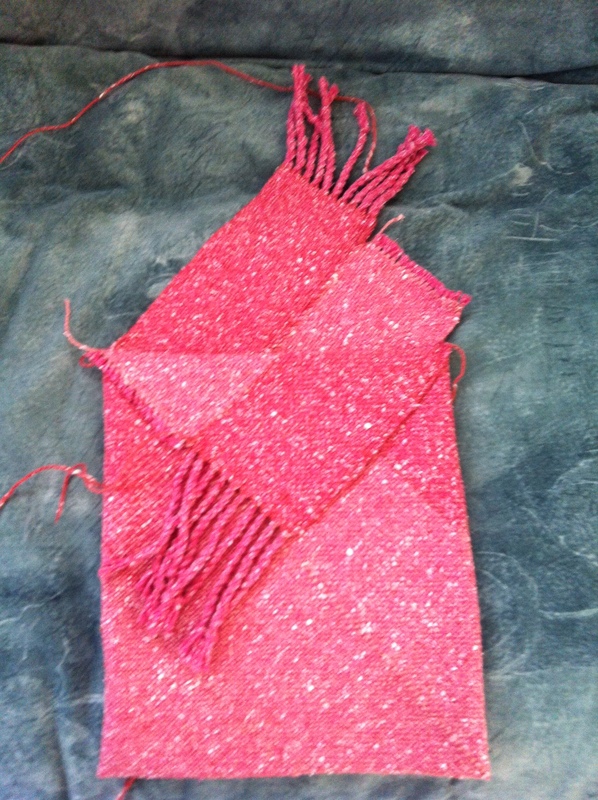 At our local guild meeting, we had discussed weaving bags or making bags from felted knitting (old sweaters, etc. ), but nothing was really grabbing me. But, when I went in February to visit another guild they talked about “origami” bags, and had an example, which was very intriguing. I could NOT figure out how it was put together. 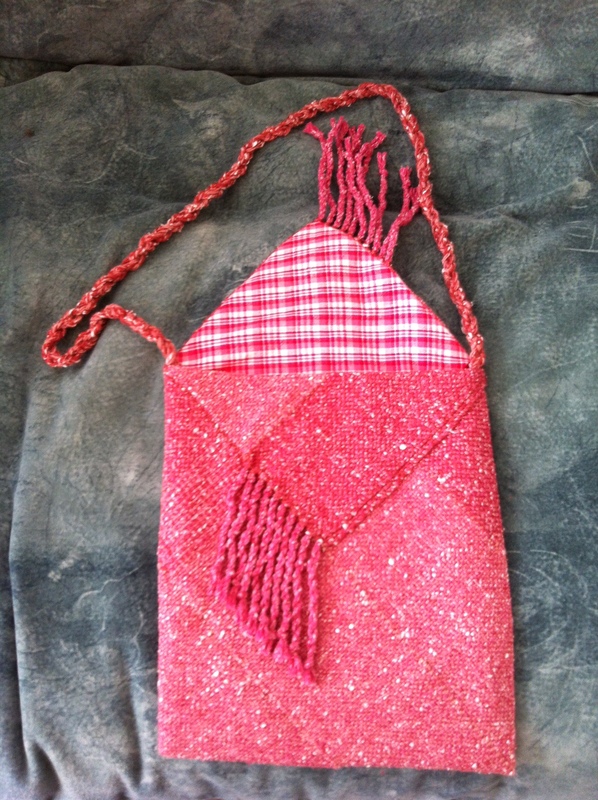 So, I googled it up and found a blog describing an origami bag made from strips of woven fabric, and I had an inspiration – I had woven a narrow scarf some time ago on the rigid heddle loom that no one seemed to be attracted to. Maybe I could use this as strips and make it into a bag. Worth a try. 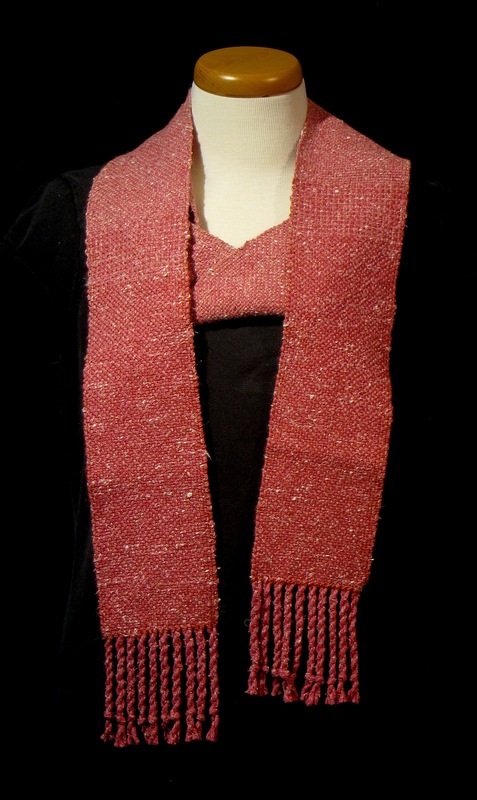 Here’s the scarf, from a couple of different blended yarns – wool, silk, cotton, linen, alpaca, etc. 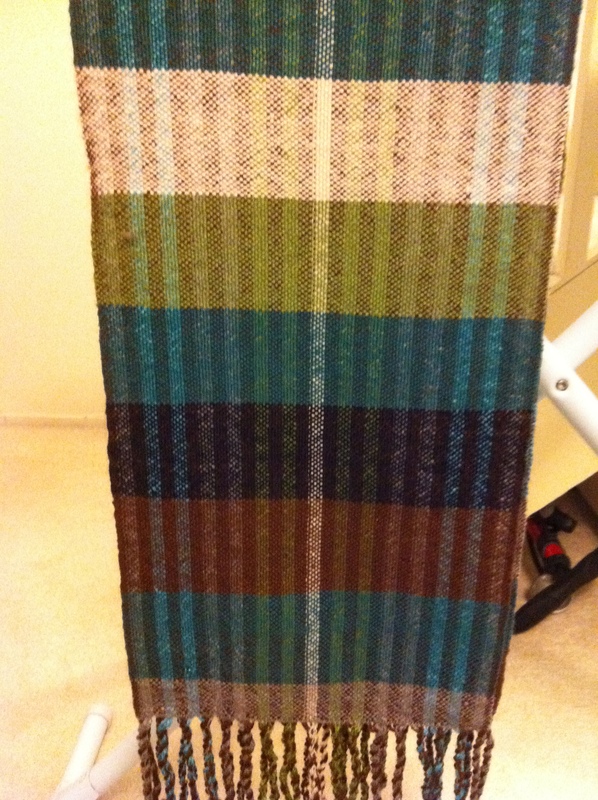 Rather a rustic look, with two similar colors of the same yarn in the weft, but a somewhat awkward join of those colors. It was a loser – what knitters call a frog. Not very exciting, and too narrow anyway. 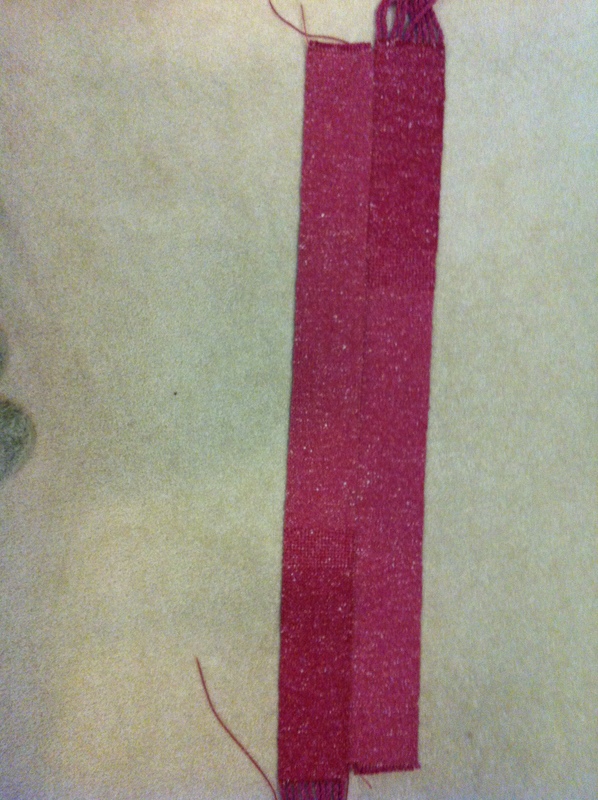 So, I cut it in half crosswise, and joined the long edges together so there was fringe at each end. 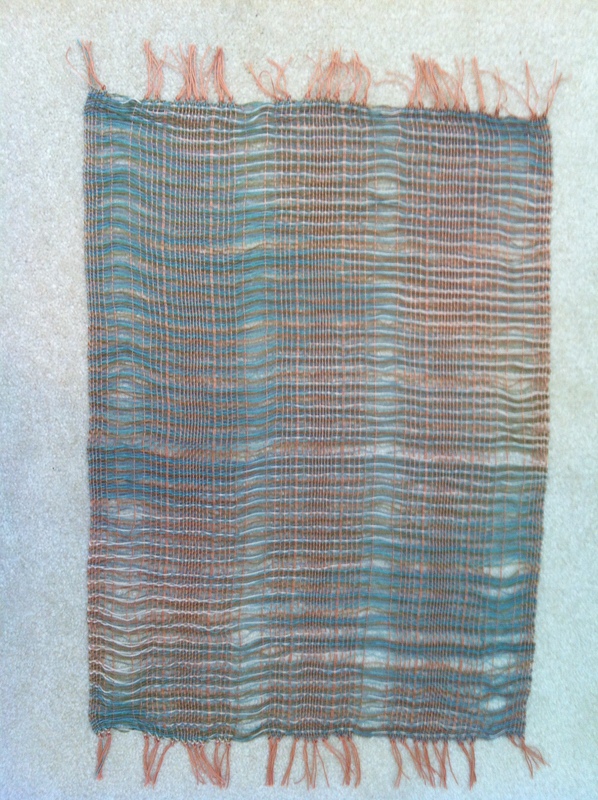 The next part was a complete experiment, following what I had googled, and folding until I had what could pass for a bag shape – quickly joining the edges, as I knew I couldn’t figure this out again… The angles of the two weft colors actually created some interest. 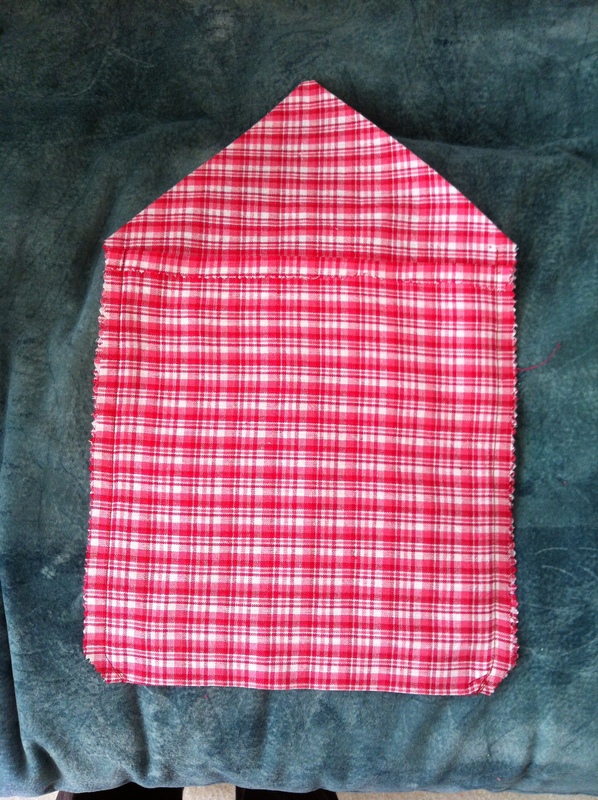 The triangle sticking up is the flap, to fold over the opening. Finding a lining fabric wasn’t as easy as I thought, but I came up with some calico-like cotton, which fit with the rather rustic feel of the yarn. I still had enough of the yarn to braid a long strap, and sewed that to the lining seam. There may have been some way to machine sew at least part of the lining in, but it seemed awkward, so I tucked the lining down in, and sewed the top edges together by hand. 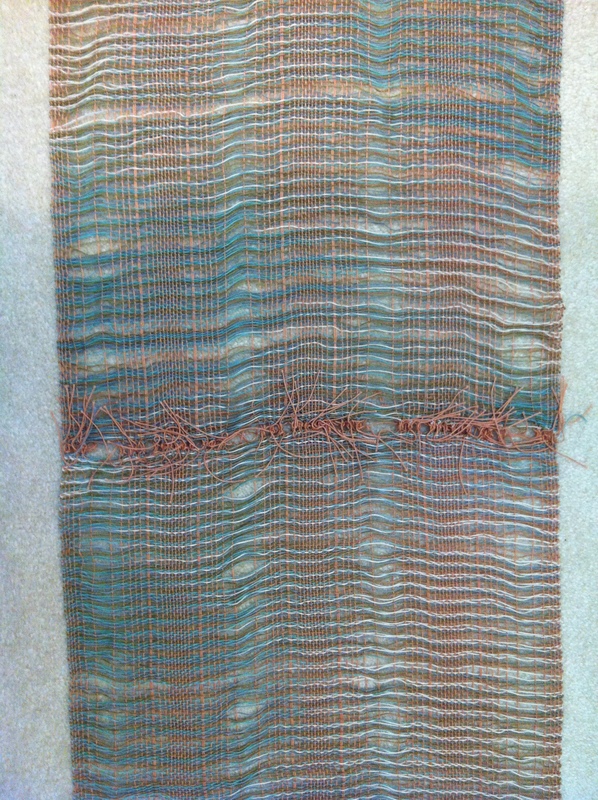 When the flap is folded over, the fringes on the flap and front come together. 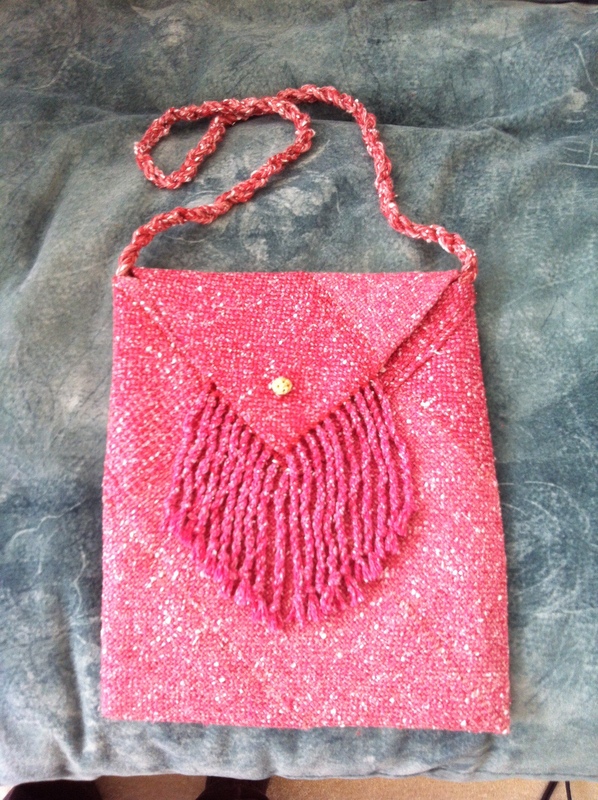 I added a bead to the flap for interest, et voila! It’s not high fashion, but at least it’s fun! 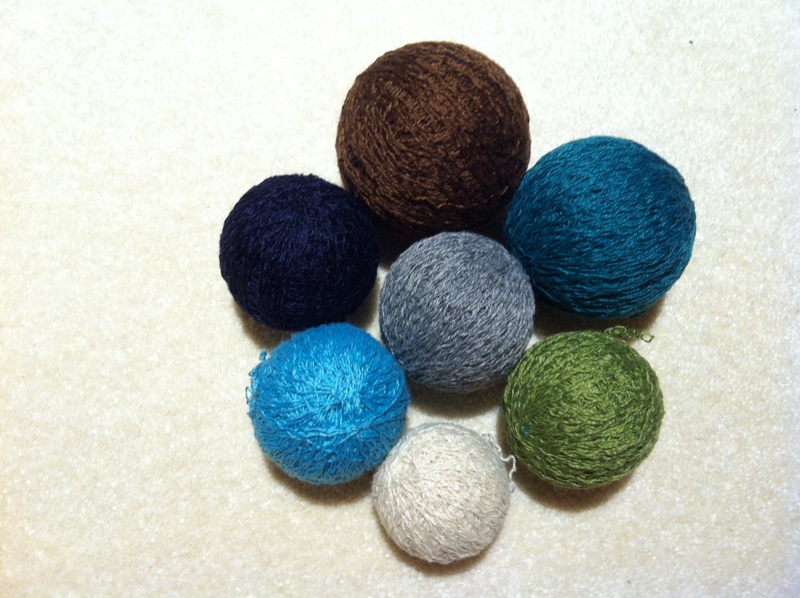 A while back I took all of my knitted scarves and pulled them apart, winding the yarn in balls to use for weaving. There was one with vertical stripes that were knitted lengthwise, so the yarn came off in 20-yard lengths. A couple of weeks ago I thought it was time to weave this one up. The 20-yard lengths made easy stripes, both warp and weft, but, the funniest thing was that the yarn had been knitted for so long it was all kinked up. 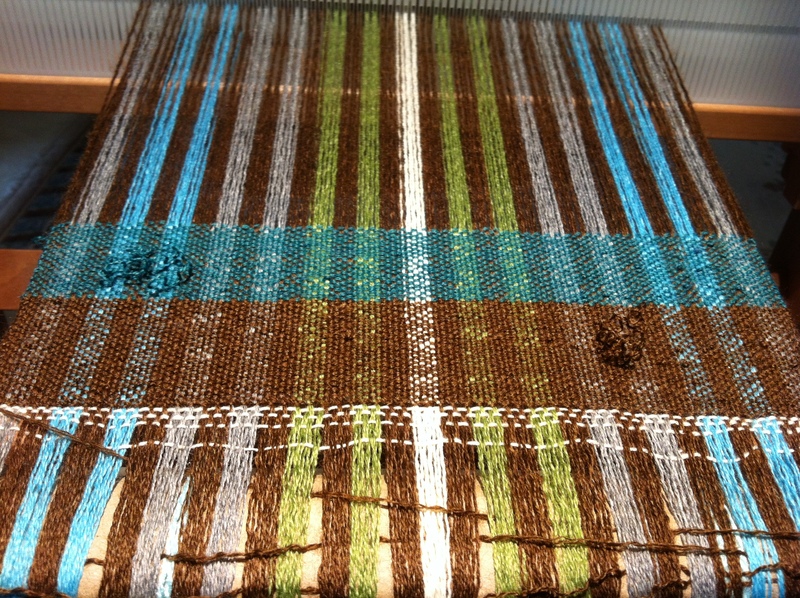 The warp straightened out pretty well, but you can see the curly ends in the blue and brown weft stripes below. Ultimately, it all straightened out pretty well in the wet finishing, and I like the result! 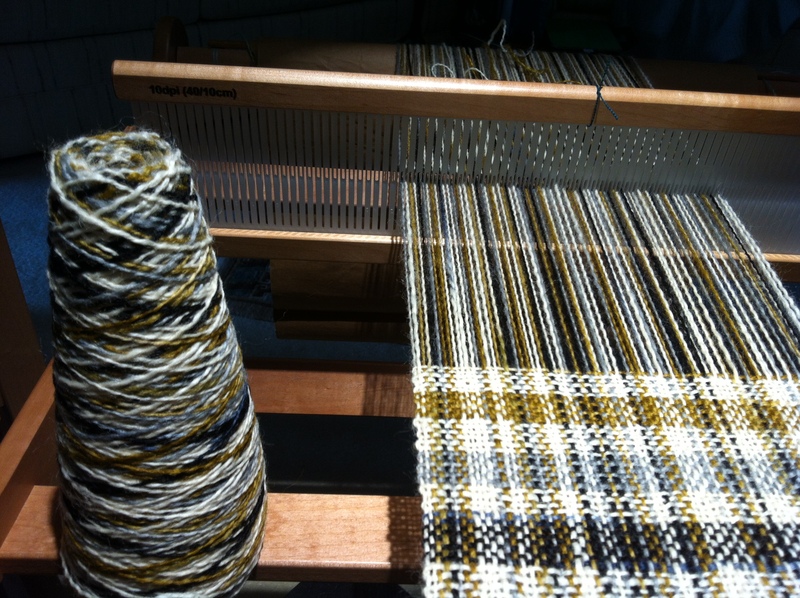 Next project was some variegated wool that someone had passed on at a weaving guild meeting. This yarn had been calling to me for some months, but it had its own challenges. There were lots of breaks in the warp right off the cone. Either the yarn had been cut by something or there were moths (fortunately not transferred to me). However, it worked up into a very nice plaid. 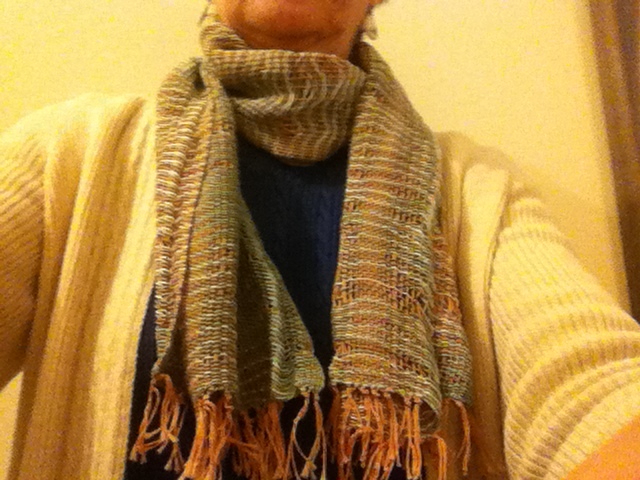 And lastly, I was leaving for a short trip to warmer climes in a few days, and realized I didn’t have a summer-weight scarf, and both looms were busy, so what to do?! I dug out something I had woven almost 2 years ago – what were supposed to be placemats – with a crammed and spaced structure, but made from crochet thread, so way too flimsy to be used for placemats. However, there were 3 of them, so maybe I could put them together to make a scarf??? Many square knots later (tying each warp thread to its counterpart on the next “placemat”) it seemed like this might work. And, it’s kind of cool. (My first selfie. There will be a better photo in the gallery when we have a chance to do the next photo shoot.) Anyway, I’m pleased with this little project, and will do crammed and spaced again. I like the unpredictability of the look.